"Let’s talk crazy book titles! Highlight one or two (or as many as you like!) titles in your personal collection that have the most interesting titles! If you can’t find any, feel free to find one on the internet!" One of my favorite book titles is Beyond Smells and Bells by Mark Galli. It was a textbook in one of my sacred music classes and one that I actually enjoyed reading. Goodreads Summary: A dancer driven to succeed. "How has your reading habits changed since you were a teen? or If you are still a teen what new genres are you in love with currently?" I definitely read more now than I did when I was a teen. My preferences have also changed. As a teen, I read mostly classics (yes, even when I wasn't reading for school) and spinoffs of classics. However, I did read Harry Potter and Amelia Atwater-Rhodes' books about vampires and witches, so I suppose it's only natural that now I read many fantasy and paranormal books. I read much more YA now than I did as an actual young adult. But given the great books that are on the market now, I think that's a good thing! I read more YA now than I did as a teenager too. You are right, there is a much better selection of YA books now. LOL on Beyond Smells and Bells...sounds so funny. NEW GFC FOLLOWER....I just love your site....fabulous design and colors. 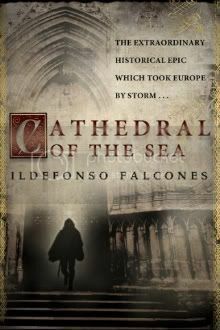 CATHEDRAL OF THE SEA is OUTSTANDING...I have a review on my site if you liked to take a look. Yay!! I loved Amelia Atwater-Rhodes too! She's want introduced me to the paranormal books when I was 13. After reading that, I didn't want to go back to "regular" books! I love YA!! And the classics are pretty good too. Great answer!! I feel I read more as an adult too!! When I was in school my most favorite thing to read about were kids who wanted to be witches or ran into witches... so I guess my tastes haven't changed too too much. Hopping through. 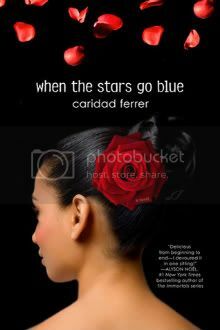 I love the covers for When the Stars Go Blue and Cathedral of the Sea. Look very romantic. hi! Stoppin by from the blog hop. Cathedral by the sea is a lovely title! Have to check it out. Thanks! I'm a new follower, I've been finding so many blogs specifically for YA fiction. It's been an enjoyable journey finding y'all. I like that you included the summaries with the two books -- that first one sounds very cool! Finally someone who was a classics reader as a teen. I still read them but definitely not as much as YA or romance novels. Thanks for stopping by my blog. I love your blog and I am a new follower.